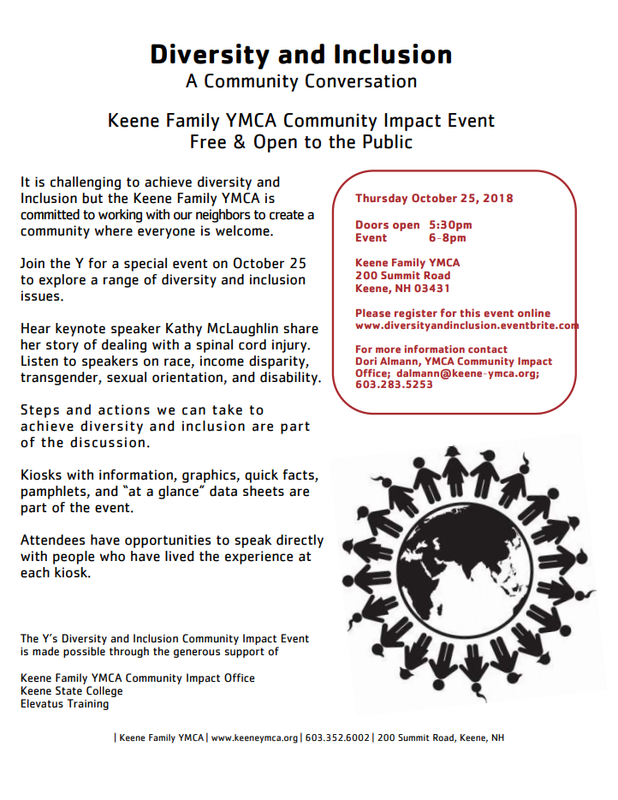 It is challenging to achieve diversity and Inclusion but the Keene Family YMCA is committed to working with our neighbors to create a community where everyone is welcome. Join the Y for a special event on October 25 to explore a range of diversity and inclusion issues. Hear keynote speaker Kathy McLaughlin share her story of dealing with a spinal cord injury. Listen to speakers on race, income disparity, transgender, sexual orientation, and disability. Steps and actions we can take to achieve diversity and inclusion are part of the discussion. Kiosks with information, graphics, quick facts, pamphlets, and “at a glance” data sheets are part of the event. Attendees have opportunities to speak directly with people who have lived the experience at each kiosk.